Where is the best ratatouille in Paris? I had an amazing omelet with ratatouille in Brugge recently. It was in a small bar outside the tourist area. It was filled with the restaurant’s extended family members. The omelet was fluffy and filled with the perfect batch of ratatouille. This got me to start wondering: where is the best ratatouille in Paris? It’s not the type of dish a restaurant builds their reputation on. It’s typically the lowly side dish that accompanies the meat and eggs. But good ratatouille is a meal in itself. 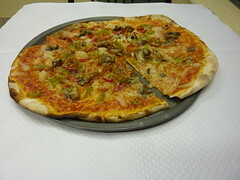 I had a great “provencial pizza” at Kosher Pizza that was essentially a thin crust pizza covered with ratatouille. Where is your favorite place? How about outside Paris? Last night, while walking home, I came across a table filled with amazing artichokes in the evening farmers market of Bercy. There were bunches of frost-kissed baby artichokes as well as some of the most beautiful full sized artichokes I’ve ever seen. This is saying something as I’ve been to the world famous Artichoke festival and the artichokes from the Santa Cruz area rival any in the world. 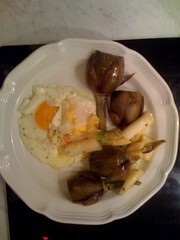 I purchased a bunch and made artichoke/white asparagus withe eggs for dinner. The artichokes tasted as good as they looked. The Parisian Sweet Bar sits about 50 yards from that table of artichokes. I was pleasantly surprised to see today’s special of artichoke pasta. This pasta was great and at 6 euros a bargain to boot. These were not the marinated artichokes of cheaper pasta dishes. These were fresh baby artichokes from the market. That’s the beauty of food in France. You don’t have to be a fancy restaurant to offer fresh, seasonal food and the prices are not inflated. Parisian Sweet Bar boasts regular specials based on the farmers market. Soups, pastas, and salads are based on what’s available for the season. You will find various gelatins, jellies, pates, and other gelatinous delicacies in Paris. There are two terms that you need to keep separate: confit and confiture. Confit typically refers to a fat based method of preserving meats. The most famous is duck confit and in particular a duck leg in confit. The Duck leg is preserved in duck fat and then seared for a crispy skin before serving. Confiture, on the other hand, is what we’d call preserves, jams, and jellies in english. There is a wonderful world of confiture in France. Look for home made bottles of confiture at farmers markets and patissiers. Favorite flavors include cerise and framboise. A bottle of seasonal, artisinal confiture makes a great gift for friends in the states. I usually bring home several bottles to enjoy a croissant and coffee and think of times in Paris. 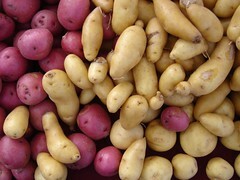 Pommes de Terre mean Apples of the Ground. These are potatoes and there are a million different preparations in Paris restaurants. You’ll especially be interested in combinations with onions and the inevitable cheese. There are many words on French menus that can be confusing. I’m speaking from experience. I missed out on some great mushroom dishes because I didn’t recognize the word champignon. So, the “Words to Look For” posts will give you an idea of what is safe, and “Words to avoid” are the harmless sounding dishes filled with friendly animals. Tartines are slices of bread. In the morning you may get a tartine with butter and jam. It’s usually half of a baguette that has been further sliced lengthwise. Salads with tartines usually have a selection of melted cheeses on them. Either way, they are very tasty and a great thing to eat if you are not vegan. Of course, you could always get a tartine with hummus.